Educators, would you like to inspire and thrive? 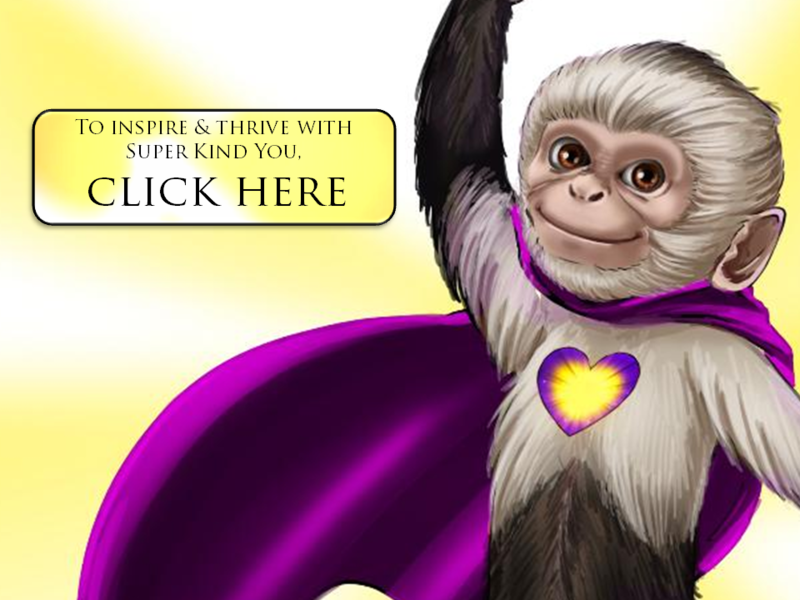 ​Introducing your teaching Super Power... You can change lives with Super Peace Monkeys! Do you feel exhausted and overwhelmed by overwork? Are you frustrated by student misbehaviour, constant noise and/or bullying? Do you need appreciation, respect and support... as well as ease and peace? We learn so much from our superheroes about how to act, how to get safe, how to resolve conflicts, and how to be powerful... how to survive and thrive. Superheroes are our role models, our mentors, our examples of how to get respect and reward. Unfortunately, most superheroes teach violence. This is the heart of the Super Peace Monkeys program. When you give kids a positive self-image, they tend to live up to it. When you give an entire class a new self-image to live up to, it builds their confidence and their sense of belonging to something great. The intro chant for Super Peace Monkeys says, “you’re superstars... you can see. 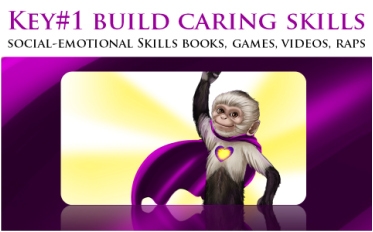 With your super peace monkeys.” You can teach social-emotional skills in a fun, inspiring way, and at the same time boost academic performance with Super Peace Monkeys videos, books, songs, games, crafts, stories and kits. For just a few examples, you can look at the free online word game and other free gifts in the Kids section at SuperPeaceMonkeys.com . There are four key social-emotional skills (not vague character traits, but specific SKILLS) that children can use to create safe and caring schools. There are four Super Peace Monkeys, and each one illustrates one of those skills. The Super Peace Monkeys curriculum integrates reading, writing, social studies, and even math, so you can save prep time and increase the amount of time that students are actually engaged in learning. Help boost academic performance (“a 2011 meta-analysis found that students who received Social-Emotional Learning instruction have academic achievement scores an average of 11 percentile points higher than students who did not participate in Social-Emotional Learning programs. 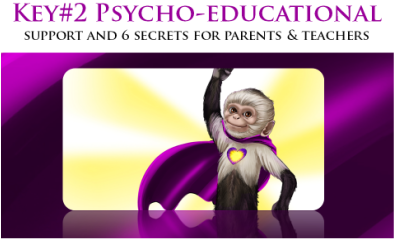 KEY TWO: Psycho-educational Support and The 6 Secrets for Parents and Teachers – this is the head of the Super Peace Monkeys program. According to research, over 82% of teachers report interest in further training in Social-Emotional Learning. 81% say that lack of social-emotional skills reinforcement at home is a big challenge (CASEL.org). You don’t need to do a Master’s in Educational Psychology and over 25 years of research into the world’s top social-emotional wellness. I’ve done that for you. Through Super Peace Monkeys, I offer Appreciation, support and The 6 Secrets of Social Emotional Wellness – in the form of fun & inspiring workshops and webinars for parents and teachers. Most of the time is spent celebrating successes and giving you practical solutions to actual behavioral issues you may be facing, based on your questions. Class management is not easy. In every classroom, there are kids are struggling with tough situations... and their self-calming skills need extra support to create safe and caring classroom. That’s where Monkey Math Money comes in. 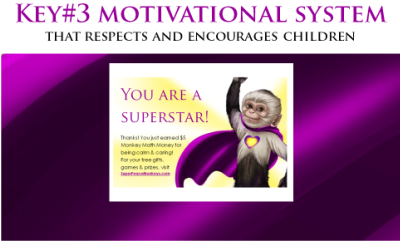 Monkey math money reinforces the “You are Superstars message” and the Psychological health skills that kids learned from the Super Peace Monkeys curriculum. When kids earn Monkey Math money cards, they can exchange them for various rewards (time on the website playing online educational games, extra recess time, extra story time, extra choice time, Super Peace Monkeys Magic Mood pencils, extra class trips, or whatever other rewards you and your class will all enjoy. You can offer individual rewards as well as class rewards. This is ONLY for positive reinforcement, you can’t lose points, and individual points are always kept private, out of respect for students. This is a system that was created by educators and kids, for educators and kids). On a scale of 1-10, where ten is perfect, how clear, respectful and encouraging is your motivational system? Yes, you can inspire, thrive, and change lives. You can learn the secrets to inspire support, respect, and appreciation for educators. You can empower students to care. ​Just click below to get started. Thanks! You make a difference. Together, we can create caring schools, and a peaceful world.